One of the most essential tools in makeup artist's kit is a primer. This is especially important when using eco-friendly and natural products, which tend not to have the chemicals and preservatives that give the "long-lasting" effect in some conventional products. Silicone-based primers have gained a lot of popularity recently, but sometimes they can clog pores. Korres makes a Quercetin and Oak Primer that is gentle and effective, while providing anti-aging benefits. This is the primer I trust enough to use on my clients. I have been looking a long time, but I haven't found many other primers that absorb so quickly or work as well. It can serve as a moisturizer on its own, but it is also light enough to be worn over moisturizer and under liquid foundation (as long as adequate time is allowed for absorption). It smells lovely and hasn't bothered a single client; many have, in fact, asked what it was that smelled so nice. This product rates about a 4 on the EWG Skin Deep database, which is low-moderate. I would love to see a fragrance-free version in the future, perhaps to help bring the rating even lower. However, I am delighted that it is a vegan formula and is still gentle on the skin. 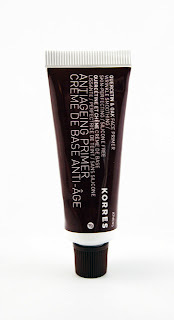 This primer is one of my favorites, and I highly recommend it for everyday wear.